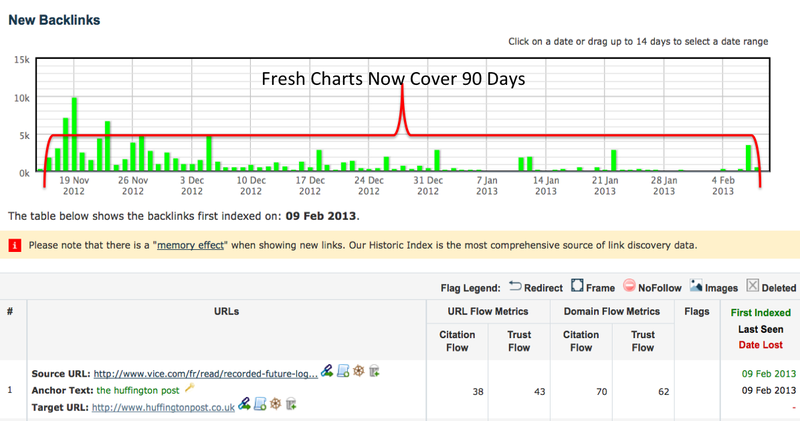 Exciting News today from the Majestic SEO camp in that they have been working hard to increase the Fresh Index Data. Previously 45 days, you can now see Fresh Index data from the last 90 Days which means that you can report quarterly link data. Majestic pride themselves on being responsive to the needs of the industry and the increased data view came about due to client requests. Other Fresh Index data within the Majestic Toolset will also be updating to reflect increased depth of index rates. This will bring more meaning to data viewed in the Fresh Mode. 90 Days can now be found on general summary charts, and as usual, you can export to Excel to change the view if you wish. For more details on the Fresh index update check the Majestic Blog. Keep checking back here this week also as there are more updates in the pipeline.